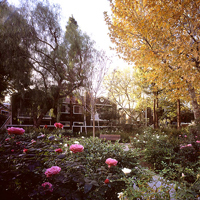 Strathern Park is a 241-unit affordable housing community located in Sun Valley, CA. The waiting list is currently closed. Each one, two, three, four and five bedroom unit includes a full kitchen, central heating and air conditioning, carpet, vinyl, window blinds, a patio or balcony, smoke detectors and fire sprinklers. Strathern Park is a controlled access building with intercom entry and gated parking. The property features a laundry facility, gym, computer learning center with internet access, three playgrounds, two basketball courts, two large outdoor courtyards, and a community garden. A variety of resident activities are offered including an after-school homework club, movie afternoons, art classes, and monthly parties. Strathern Park is conveniently located near a public park, retail centers, banks, major bus and train routes, grocery stores, and restaurants. Our Goal is to enhance the world in which we live and enrich the lives of the people who reside in our buildings. © COPYRIGHT 2019 - THOMAS SAFRAN & ASSOCIATES. ALL RIGHTS RESERVED.